SAP business one is the pioneer of Enterprise business resource software for small and medium sized business. Through its new release of SAP Business One 9.3 in 2017, it shows that it takes into account all its customer feedback as it is the most reliable and easy to use software with some many additions which add value to businesses operations. Small and midsized enterprises (SMEs) and subsidiaries of large enterprises can look forward to the general release of SAP Business One 9.3. 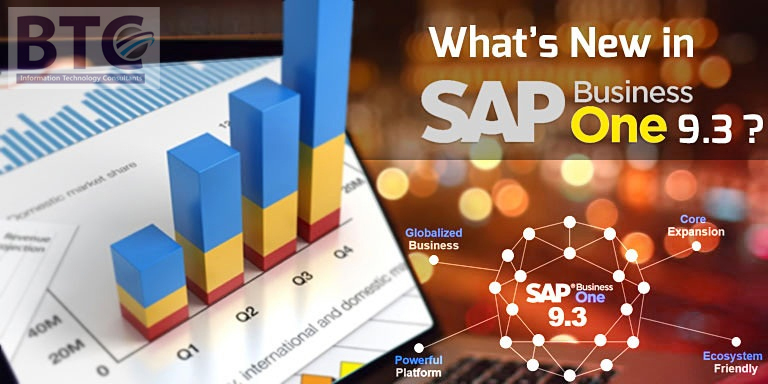 Now SAP Business One 9.3. is with us and made available to customers since 28 March 2018. What are the improved features in SAP Business One 9.3? It has been the feature of SAP Business One that you can set and administer the users quite efficiently. The new version is providing a range of features to make digitization easier. This version provides you the facility to collect data directly from Excel. Along with that, additional changes can also be implemented. This feature will save your time of importing data and adding new users. Managing multiple branches was never an easy job. But, with SAP Business One 9.3, the businesses will operate multiple branches comprehensively. You will tie all the information gathered from different branches and generate centralized insight. You can manage the functionality of different branches with some enhanced features like the advanced level of data and document filtration. This feature also has the ability to assign rights of only a specific branch for reducing the conflicts and generating reports for each branch separately. Light manufacturers will have some additional benefits which will help them in establishing their businesses smartly. If you will adopt this version, you will get a competitive edge over all others and improve your business operations as well. A new “Routing” feature has been added in a new version of SAP Business One to provide a specific benefit to light manufacturers. This feature will improve the production module for light manufacturers. Previously, the businesses invested in add-ons to utilize this feature now, but they will enjoy it without investing extra in ERP solutions. SAP Business One has been the most important ERP solution for most of the businesses due to its extensive customer support services. Its new version has taken it to a new horizon as a wide range of features has been incorporated in it. The vendor has added an automated Return Material Agreement Process (RMA) in it to make the return policy more convenient and hassle-free. These enhancements will improve the operational activities and customer support services in such a way that all tasks will be completed in an efficient way. You can manage the return process quite effectively with SAP Business One 9.3. The users can create a return request by themselves and start the process through this advanced version. The vendor added a return to reason and action here to protect the rights of both, the business and customers. Project management is the most difficult task for all businesses sand to make it simple, the businesses engage SAP Business One which provides you the most sophisticated suite. You will find the new version more calculated, authentic and upgraded source of managing the project successfully. With SAP Business One 9.3, you can also manage transactions even on the project stage. Through this addition, the costing procedure will become easier and you can conduct the analysis at this stage. There was always a need for improvement in the pricing section when we discuss SAP Business One. Previously, we were tying the prices with the stock unit and it was available in an overall system. In this version, the vendor has improved its functionality in such a way that you define the price of each product separately and after that, the selection of pricing unit will be conducted. You can also categorize the pricing from lowest to highest. Average prices will be selected by default according to the hierarchy. The options on the time period, volume discounts, and special prices are also a part of this version. BTC has been providing financial services to businesses in the UAE for many years and now has an extensive field in this field. If you need to deploy SAP Business One 9.3 in your organization, BTC provides you in-depth knowledge about the product and guide you towards benefits for your business through enhanced featured provided in this latest version. To learn more about the latest version of SAP Business One contact our experts.